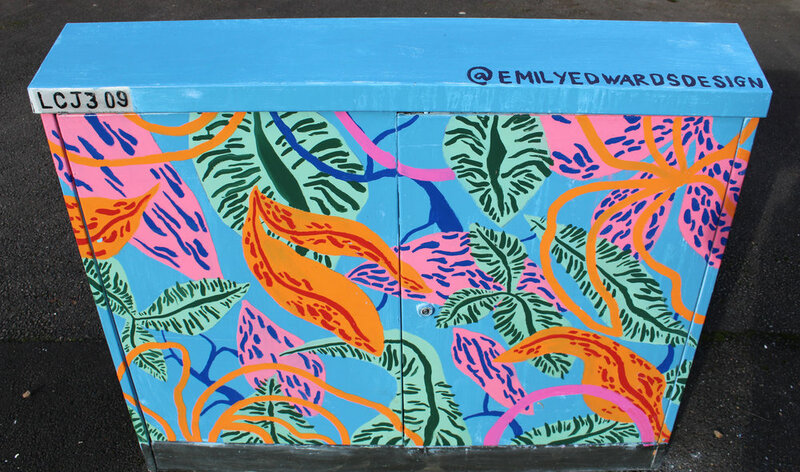 The Virgin Boxes project was intended both to brighten the streetscene in the Ash Road area and to discourage graffiti. The local Environmental Enforcement Officer initiated the project between the Ash Road Area Residents Association (ARARA) and Virgin Media. 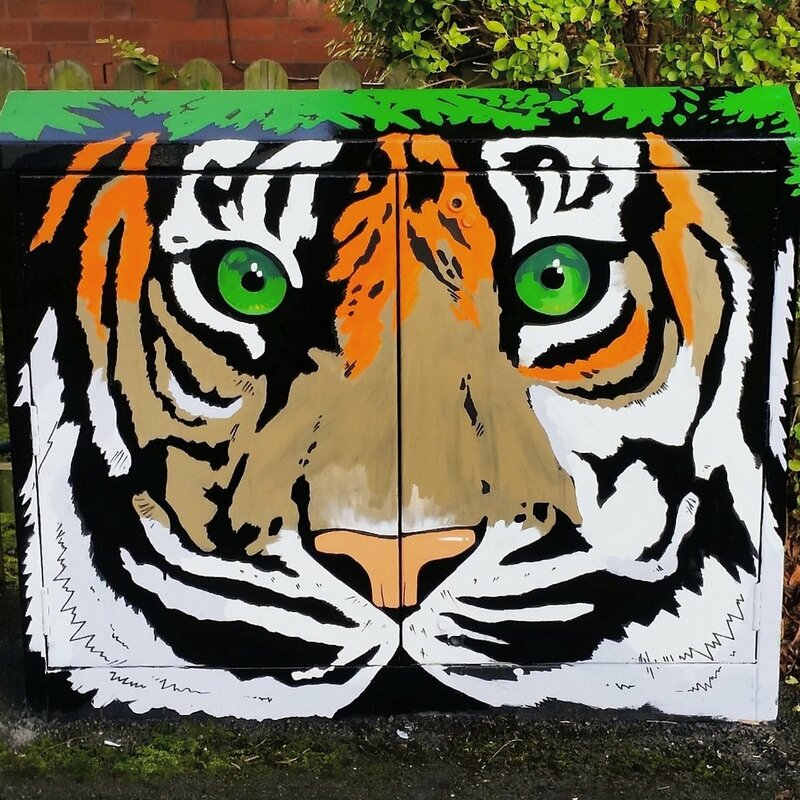 In 2016, ARARA established an Art Working Group, which negotiated an agreement with Virgin Media, found funding from Headingley councillors, and invited designs from students at local colleges. 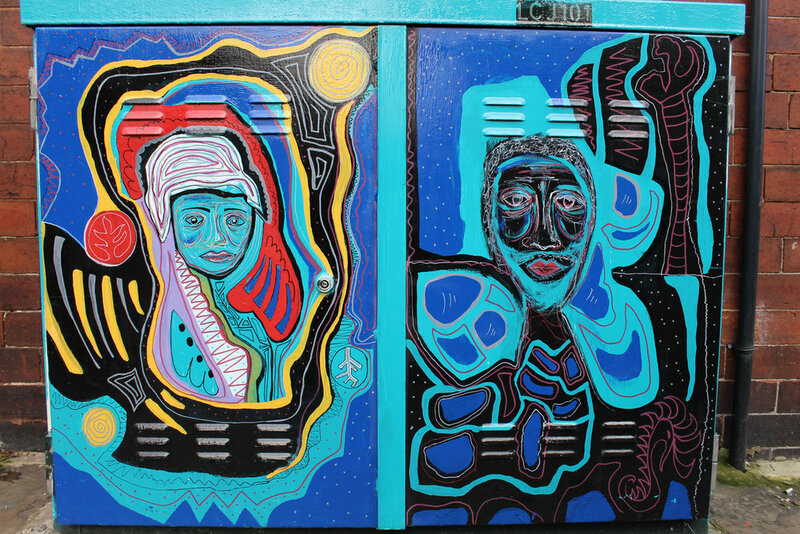 The communication boxes were prepared and protected by ARARA, and during November 2016, they were painted by the students. The project was completed by Christmas, and launched at a Celebration at HEART in February 2017. Photographs by kind permission of Ash Road Area Residents Association (ARARA) and Richard Tyler (RT). 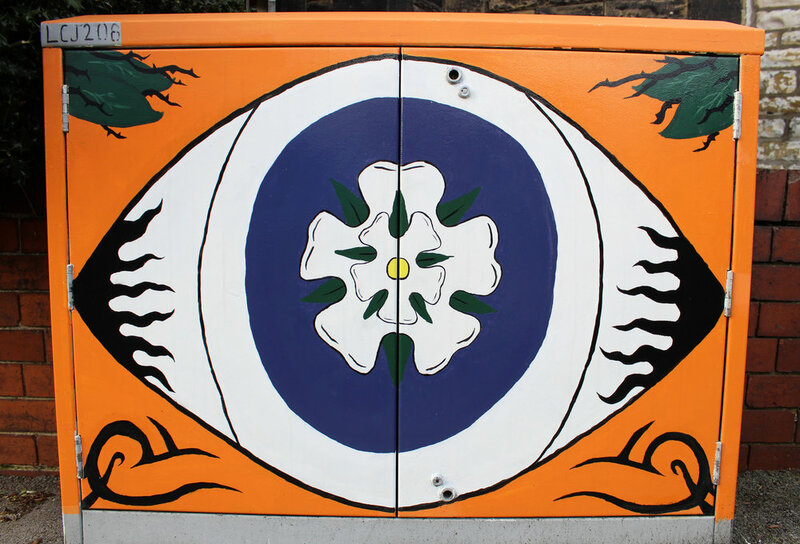 It was Burley Wood residents, working with Leeds Beckett Students Union, who first decorated boxes. Chris Baird, the Environmental Enforcement Officer for our area, seeing that this had reduced graffiti, and noticing that Communication Boxes in the Ash Road Area were in a terrible state, met with Virgin Media and a representative of Leeds Beckett Students Union to discuss doing a similar project in our area. A member of the Ash Road Area Residents Association (ARARA) joined them in submitting a written proposal. Verbal permission was given easily but it was seemingly impossible to get this in writing. At the July 2016 meeting of ARARA, an Art Working Group was formed which met later in the summer. There were obstacles. For instance, we still needed written permission from Virgin Media. And we discovered that the work would need to take place in November, since students started exams in January 2017, and after that would be too busy. We also needed funding for anti-graffiti lacquer. Our ‘spec’ asking for original designs and including a colour palette, was circulated by Leeds College of Art, East Street Arts, the University of Leeds and Leeds Beckett University. We were very grateful for the enthusiasm of these organisations. The Working Group met regularly to look at designs. We had 12 artists to begin with. Later, local residents would also do boxes. Two ‘breakthroughs’ were 1) a MICE grant of £300 from Headingley councillors to help with paint, etc, and 2) help from Helen Capocci of Burley who gave us new contact details for Virgin Media - and within about 15 minutes of that we had written permission. We were terribly excited by the quality and diversity of the designs but had little idea how it would ‘go’ working with a range of artists. That turned out to be an absolute delight. Without exception, they were a pleasure to work with – talented, good humoured and reliable. So there they then sat, in the cold and often dark/damp, painting their boxes for literally hours, attending to the tiniest details of their designs. Before they began any box, we ensured it was sanded down, washed and undercoated. Then in the evening, when their day’s work had dried, Paul Hudson and I would cover each box as protection from graffiti. Once the design was complete we could anti-graffiti it and relax. Passers-by were delighted and the artists received immense appreciation. Everything that could be done was finished by Christmas, and in February 2017, we had a Celebration at HEART where the designs were exhibited, and local residents invited. In the following summer we were approached by Ellie Heywood, a calligrapher who had just graduated from art school and lived locally. We agreed she could do the 20 little Virgin boxes (about a foot high) which are scattered amongst the streets. She would calligraphy one letter per box. It would form a sentence, which no one would probably notice, saying “May You Stay Forever Young”, though not all were done in the end. There were plenty of ‘treats’ in the project, but three I’ll mention. One was the contact for Virgin Media, Phillip Hughes, who had given us permission and support. At the Celebration evening we found that he himself decorates boxes when he gets a chance! Another was Mark Johnson, of Urban Hygiene, from whom we purchased our ‘easy-on’ anti-graffiti clear glaze. 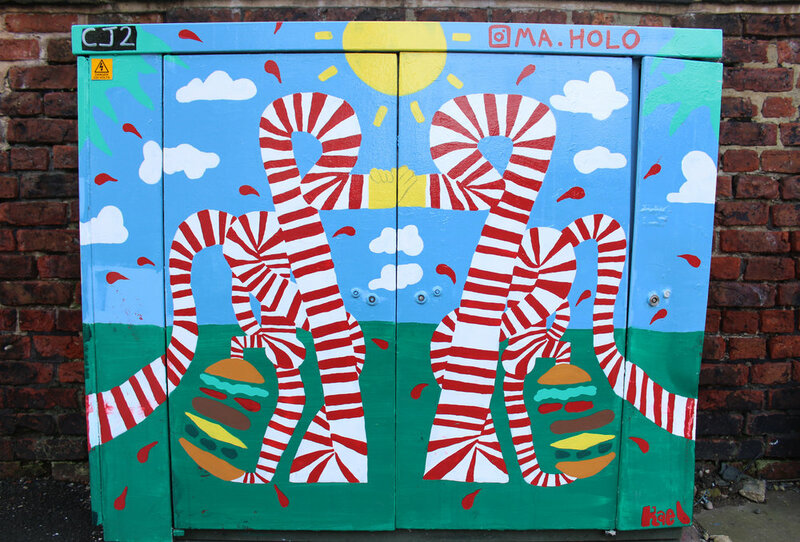 He in fact actually adores street art, was hugely excited by the project, and gave us a reduced cost on our first order. And the third was Ken Payne, a local resident who lived in the Trelawns for over 80 years, and who agreed to be part of our Art Group. Himself a talented actor and wit and lover of all fine things, he kept us in chocolates and laughter throughout. He very sadly died just before Christmas 2018. The project, and ARARA itself, he would say, gave him some fun. 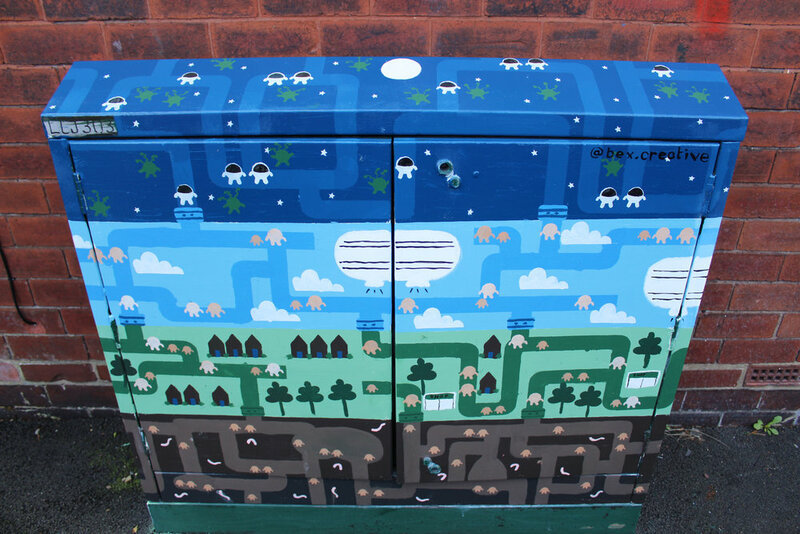 See also Independent Life, LS6 Street treats for another account of the project, and Leeds Arts University, Students transform Virgin Communication boxes in Leeds for comments from some of the students involved.